Tony Andrews, founder of Turbosound and Funktion-One, is no stranger to Glastonbury Festival, having been present and part of the sound crew at Glastonbury Fayre in 1971. He later persuaded Michael Eavis to bring back the festival in 1979 and to make it an annual event. Tony was a prominent member of the team of seven who built the permanent Pyramid Stage in 1981, which existed until it was burned down in 1994. The sound systems designed by Tony and his team provided sound for the Pyramid Stage for many years. The Iconic Flashlight System made its debut on the Pyramid Stage before going on to provide an amazing sonic experience for 350,000 people who attended the Roger Waters historic Wall Concert in Berlin 1990, which celebrated the fall of the Berlin Wall. The team have recently launched Vero, which is their latest large format touring system that is taking arena sound to a new level. Vero is already appearing on the riders of artists such as Nile Rogers and Chic, Underworld and electronic music aficionados such as Richie Hawtin and Carl Cox. Tony’s loudspeaker designs through Funktion-One were at the forefront of musical evolution and the emerging dance music scene. It was early 1992 when he travelled to Glastonbury to visit his friend Michael, excited to talk about the new youth culture phenomenon which was happening and to ask Michael for a space at the festival where he could put on an electronic music party. Castlemorton Common Festival and the legislation which sought to stop music ‘Wholly or predominantly characterised by the emission of repetitive beats’ had not yet occurred and despite Michael’s aspirations to all things leading edge he thought it would be a rave and therefore it was a bridge too far. However, he relented, setting aside an area for Tony’s idea and of course being careful not to make the area part of the official festival in view of the rising moral panic which seemed to be surrounding the early electronic music scene at that time. 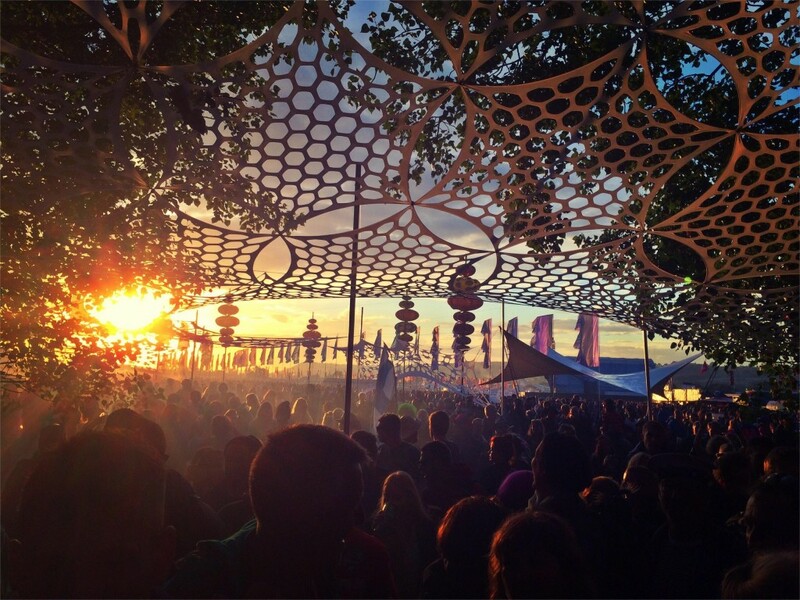 The Experimental Soundfield, as it was named, was a great success and marked the first occurrence of an electronic dance event at Glastonbury Festival. It attracted around 8,000 people on the Saturday night, dancing within a four point soundfield surrounded by music that was a collaboration between some then unknown, now famous, DJs and musicians which included Darren Emmerson, Rick Smith and Karl Hyde from Underworld. The Experimental Soundfield that took place at the 1992 Festival was the precursor to the Glastonbury Dance Tent and the now Dance Village which includes Silver Hayes. Glastonbury Festival 2016 will see the return of the Experimental Soundfield in an official capacity within the Glade Arena, taking the sound to another level. The Ambisonic Soundfield is six positions of Funktion-One loudspeakers arranged in a perfect hexagon, 38m in diameter. Two of the positions are either side of the stage like a standard left and right setup. These two positions have enough power to be used alone without the other four which make up the rest of the hexagon. The remaining four positions, each consisting of two BR121s, two F215s and two Evo6EHs are used to add dimension to the main left and right stacks and/or moving events. The Ambisonic system is not a discreet system where various sounds are sent to particular loudspeaker positions. It is a system where all the loudspeaker positions conspire to give a sound a location within it. Follow the Glade Area at Glastonbury on Facebook.